Sand dressed pitch maintenance is a key part of looking after and caring for a sports pitch. 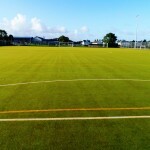 With a regular maintenance scheme, you can be sure that your sports pitch will survive for much longer than a sports facility that does not. There are two main types of maintenance, reactive and proactive maintenance. Proactive maintenance is the method of sand dressed pitch maintenance you’ll be carrying out the most. Proactive maintenance is taking an approach to ensuring that your sports pitch is completely safe, and there aren’t any issues with playing characteristics. Examples of proactive sand dressed pitch maintenance is grooming the pitch, this means removing any contaminations from the surface of the sports facility that may be causing damage to the synthetic carpet, or could be posing a safety threat to those using it. Another form of proactive maintenance is regular moss and algae treatment, this will ensure that if there is any moss and algae, they are completely removed and will ensure that it won’t come back and damage the pitch. The second main type of sand dressed pitch maintenance is reactive maintenance, this is dealing with a problem after it has occurred, and this could be through repairs, rejuvenation or resurfacing. Rejuvenation is extracting and replacing the contaminated sand infill which will help maintain the structure of the surfaces fibres, and ensure that the porosity and drainage qualities of the sports pitch aren’t lost. Sand dressed surfaces cleaning costs can vary, the biggest factor that can affect the price is the area size of the sand dressed pitch, obviously the bigger the area, the more maintenance and materials required to do the maintenance. 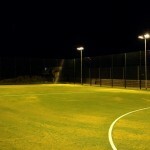 Although having to spend money on cleaning and maintaining the sand dressed surface may seem like a chore, it really should be seen as an investment as it ensures that your surface is completely safe and has the best performance characteristics for the longest amount of time, making the sand dressed surfaces cleaning costs worth it in the long run. 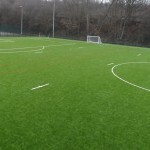 We believe that the sand dresses surface cleaning costs should be taken into account within the budget set out for the installation of the sports facility, as the maintenance and cleaning really is a key part of the sand dressed pitch’s life. We want to offer the best quality services and products to our customers to ensure they are happy with their product; we will also do our best to offer as many different options for the client to choose from to ensure they are able to stay within their budget.